Bring The Fresh Italian Kitchen to Your Neighborhood! 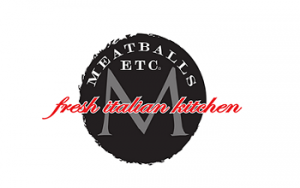 At Meatballs Etc.®, we understand that our customers are the driving force behind the success of our franchise system. As such, our purpose is to maintain satisfied customers by offering an enjoyable, truly authentic Italian experience like no other fast casual restaurant can. We make our menu items following family recipes passed down from generations and use only the best and freshest ingredients in order to create exceptional taste, quality, and appearance. The menu items are served by our friendly staff that are trained not only to provide an exceptional level of service but also to create a warm inviting atmosphere for each guest who walks through the door. And this atmosphere is supported by our restaurants themselves, with their casual yet contemporary décor, outstanding customer service, open kitchen design, and impeccable cleanliness. Dine In: With a fast casual dining atmosphere, bringing together families, businesses, teams, religious communities, and schools. This is the heart of our Meatballs Etc. Culture. Carry Out: For the ones who are on the go, on the way home from work, to and from after school events, late night nosh, we offer our entire menu to go. Online Ordering: On the go? Always ordering the same thing? No matter what kind of guest, we make it easy to get orders placed. Why tie up the phones and your staff with tedious phone in orders? Let your staff concentrate on what matters most, your guests! Beer and Wine: We offer a selection of beer and wine to complement your guests' dine in experience. Fundraising / Sponsorships: Meatballs Etc. hosts events in house for your community. In addition to supporting your local groups/teams, you expose your brand to new guests that will return with their families to make Meatballs Etc. their new home! Eating Al Fresco: Al fresco dining is especially popular in the summer months when temperatures and weather are most favorable. In order to promote and accommodate the pedestrian activity and vibrancy associated with al fresco dining, some communities have passed ordinances permitting it, including the service of food and beverages to customers at pavement tables until late at night. The Meatballs, Etc. Franchise Training Program is extensive. You will learn everything that you need to learn about operating and managing a Meatballs, Etc. franchise location. Training Includes nearly 4 weeks of hands on experience in Annapolis at our Corporate Offices and at multiple locations within the Annapolis area. In addition to the initial training program in Annapolis we will spend time with you prior to opening and during the first week of operations. We also are available to offer additional on-site assistance or training based on your needs. We may offer refresher training programs or meeting for our franchisees.